Upstate New York kicked off its inaugural GOONERFEST with tremendous fashion in Rochester, NY for this past weekend’s match against Stoke City on September 12th. Gooners from around the region (Rochester, Buffalo, Ithaca, and Syracuse) converged at one of Arsenal America’s newest officially backed establishments, Brickwood Grill. Brickwood’s instantaneous and whole-hearted embrace of the ROC Gooners this offseason was almost as significant as the acquisition of our newly beloved Petr Cech and his magic hat! It’s owner, Jeff, and his staff have been nothing short of fantastic in helping to promote and expand Rochester’s AA chapter, ROC Gooners. ROC Gooners quickly gave Brickwood an Arsenal makeover hanging a plethora of flags, scarves of other AA chapters from around the country, and, the piéce de resistance, a kit signed by The Invincibles that was generously donated by one of our own, Taggard Andrews. With Brickwood decked out in Arsenal colors, any Gooner that stumbles in would feel right at home upon entering its threshold. GOONERFEST was destined to be a smashing success from the start. After last season’s visit to Buffalo, NY at Mes Que, the ROC Gooners brass was dead set on getting Upstate New York’s Gunner faithful together for an annual bash at our new home, Brickwood Grill. With two gigantic ROC Gooners flags adorning Brickwood’s front windows, you could feel the excitement by simply driving past on Monroe Avenue. Brickwood’s mahogany walls rang with raucous songs that could have been heard at the Clock End in North London from the minute Gooners started piling in. Voices from 4 cities created a chorus urging on the Mighty Arsenal to a hard fought 2-0 victory over Stoke. Theo Walcott’s deft touch in the 31st resulted in an eruption of elation as many Gooners from across Upstate New York celebrated arm in arm. 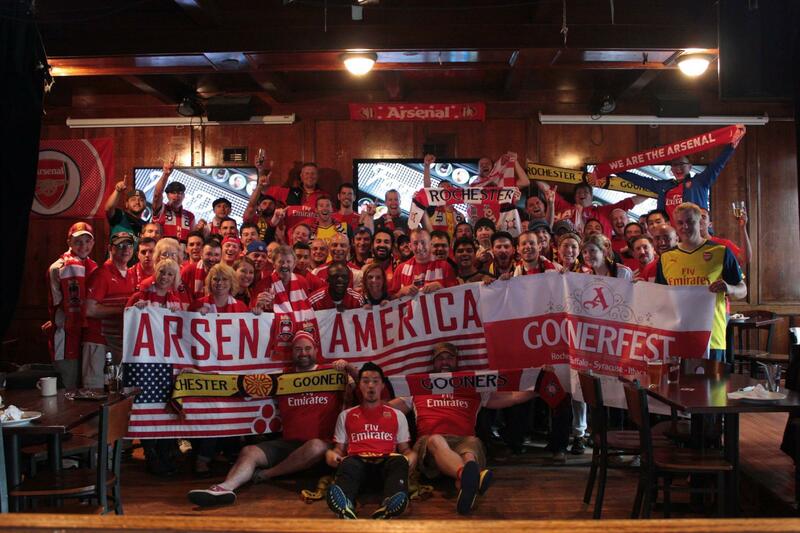 As the whistle signaled for halftime, the newly formed Upstate NY Gooner family gathered for a photo with the Arsenal America banner, the GOONERFEST banner, and scarves and other flags to document the joyous occasion. Once thrust onto social media by @ROCGooners, the “family portrait” was seen and quickly shared by none other than NBC Sports Network. Throughout the match, several giveaways and specialty taps, including Fuller’s London Pride, ensured Gooners from all over left with more than a victory and a smile. Along with the giveaways, the ROC Gooners had t-shirts, stickers, scarves, pennants, and more available to any in need of ROC Gooners swag. As the second half came to a close, Olivier Giroud found the back of the net in the 85th and the Gooners of Upstate New York filled the air with songs of victory. This epilogue would be remiss without mentioning the outstanding service and hospitality of Brickwood Grill and it’s staff. GOONERFEST would have remained a pipedream instead of a reality without them. Also, a special thank you to the Gooners of Buffalo, Syracuse, and Ithaca for making the trip to the Flower/Flour City in support of our beloved boys in red. ROC Gooners can’t wait for the next GOONERFEST!